The image of the oldest photo I have is hsown here. 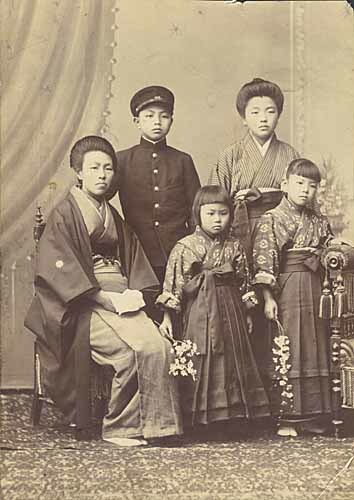 It was taken in the spring of 1908 (the 41st year of Meiji) to send to the father (my grandfather) of the children in this photo on the occasion that three of the children entered new schools. My grandfather was on a long business trip of inspecting education systems in European countries. 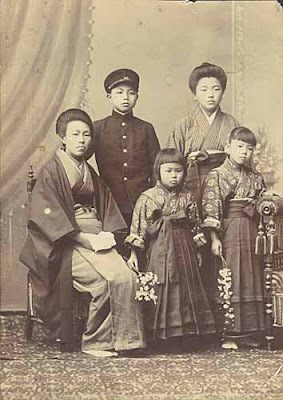 From left in the front row: Misu (my grandmother, 39 years old), Chiyoko (my mother who was 6 years old and just entered the Elementary School Affiliated to Kanazawa Women's Normal School) and Fumiko (one of my aunts, 8 years old and in the 3rd year class at the same school as Chiyoko's). From left in the rear row: Toshibumi (my uncle who was 13 years old and just entered Kanazawa 2nd Middle School) and Yuki (one of my aunts who was 15 years old and just entered Kanazawa Women's Normal School). I have never met Yuki, because she died young. My mother used to call her Okinesan (big sister).